The heart is the workhorse of our body it pumps out 5 liters of blood every minute every hour of every day that we live. When we demand more from it like during exercise or panic it responds and all it asks for in return is nourishment. The source of nourishment for our heart is oxygen rich blood that is supplied to it by the two main coronary arteries namely left and right. 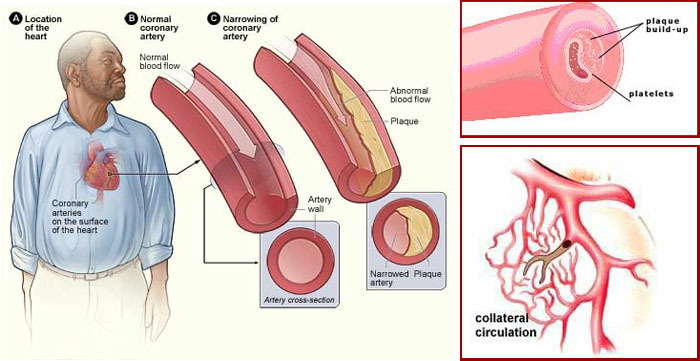 Coronary artery disease is the narrowing or blockage of the coronary arteries caused by atherosclerosis known to the common man as “clogging” of the arteries. It is the buildup of cholesterol and fatty deposits on the inner walls of the arteries that restricts blood flow to the heart. This can be in the form of a circumferential block or a plaque on a single wall which is big enough to obstruct the flow of blood. It is these plaques that can be dangerous and cause sudden death. Without adequate blood, the heart becomes starved of oxygen and vital nutrients. When the blood supply does not meet the demand chest pain or angina happens. When one or more of the coronary arteries are completely blocked, a heart attack or myocardial infarct may occur. Your coronary arteries are shaped like hollow tubes through which blood can flow freely. The walls of the coronary arteries are normally smooth and elastic. Any damage to the inner lining of the arteries will trigger a defensive healing response from our body. The process of healing makes our vessels stickier and the reparative cells,proteins and fats form a “Plaque”. The plaque can be soft or hard if calcium is added to it, these ca rupture and cause life threatening heart attacks or remain fixed to the wall and cause angina which worsens with increasing blocks. Coronary artery disease starts when you are very young. Before your teen years, the blood vessel walls begin to show streaks of fat. As you get older, the fat builds up, causing slight injury to your blood vessel walls. It is for this reason preventive cardiologist recommends early lifestyle changes and prevention of childhood obesity. In growing metropolitan cities world over traffic snarls are the norm and it is a blessing to know the side lanes to avoid getting stuck in one. In years gone by our ancestors did a lot of manual work and were less technology dependent. This made them open up the smaller connecting arteries or side lanes. Collateral circulation is the development of new blood vessels that reroute blood around the blockage. The current generation communicates wireless and manual work is restricted to a few. Exercise is obsolete for the majority and hence collateral circulation or side lanes of the heart are all closed. This lack of collateral circulation puts the young patients at risk of losing a large portion of the heart muscle in an attack. The only mode of opening these channels is exercise and 30 minutes a day is sufficient to keep the cardiologist at bay. Angina pectoris translates as tight chest. It feels like an oppressive, heavy, crushing pain or a constricting feeling in the centre of the chest behind the breast bone (sternum) or on the left side of the front of the chest. The pain can radiate out to either one or both arms, more often the left. It can be experienced in the throat, jaw, the stomach and, more rarely, between the shoulder blades. Once these trigger factors stop, the pain generally abates quickly. Usually within 2 to 10 minutes. 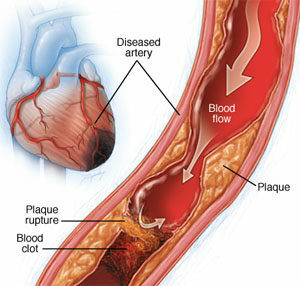 In most cases, the cause of angina is coronary atherosclerosis (thickening of the arteries supplying blood to the heart). These arteries supply the cardiac muscle with blood and therefore oxygen and nutrients. Narrow coronary arteries reduce the blood flow to the heart muscle. This is usually noticed at times when the heart muscle needs more blood supply, such as during exercise. The heart, when it increases its workload, will receive too little oxygen which causes pain in the heart. In severe cases this can also happen when the heart is at rest. All symptoms typically occur in connection with physical exertion or psychological stress. They are often worse in cold or windy weather, and sometimes after big meals. A sense of heaviness or numbness in the arm, shoulder, elbow of hand (usually on the left side). The discomfort can radiate into arms, teeth, ears, stomach or between the shoulder blades. More severe unstable angina can be associated with the same symptoms at rest. Ischemia is a condition that occurs when the narrowed coronary artery reaches a point where it cannot supply enough oxygen-rich blood to meet the heart’s needs. The heart muscle becomes “starved” for oxygen. This may result in chest pain or other symptoms like shortness of breath and palpitations and sweating out of proportion. Ischemia is triggered by any activity such as stress, excitement, exercise that will cause an increase demand of oxygen rich blood by the heart. The heart is not able to match this increase need as the coronary arteries are blocked and hence we get “chest pain or angina”. When ischemia is relieved in less than 10 minutes with rest or medications, you may be told you have “stable coronary artery disease” or “stable angina.” Coronary artery disease can progress to a point where ischemia occurs even at rest. Ischemia, and even a heart attack, can occur without any warning signs and is called “silent” ischemia. Silent ischemia can occur among all people with heart disease, though it is more common among people with diabetes. The most common symptom of coronary artery disease is angina (also called angina pectoris). Angina is often referred to as chest pain. It is can also be described as chest discomfort, heaviness, tightness, pressure, aching, burning, numbness, fullness, or squeezing. It is very often mistaken for indigestion or heartburn. Angina is usually felt in the chest, but may also be felt in the left shoulder, arms, neck, back or jaw. If you experience any of these symptoms, it is important to call your doctor, especially if these are new symptoms or if they have become more frequent or severe. Your doctor diagnoses coronary artery disease by taking a detailed medical history, analyzing your symptoms and risk factors, and performing a physical exam. Diagnostic tests, including blood tests such as cardiac enzymes( these are enzymes which are secreted when the heart muscle suffers ischemia), an electrocardiogram (ECG ), exercise stress tests, cardiac catheterization and others. These tests help your doctor evaluate the extent of your coronary heart disease, its effect on the function of your heart, and the best form of treatment for you. The gold standard diagnostic test has been the coronary angiogram. In those with soft symptoms and no major risk factors one can also do the coronary computed tomography angiogram (CTA or 64 slice CT angiogram), it is a good screening tool but one should understand that the cardiologist or cardiac surgeon will need a good old angiogram in order to do any intervention. Coronary angiography is an x-ray examination of the blood vessels or chamber of the heart. A very small tube (catheter) is inserted into a blood vessel in your, upper thigh or arm. 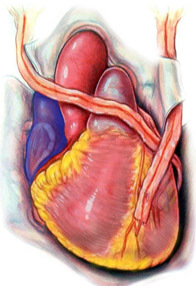 The tip of the tube is positioned either in the heart or at the beginning of the arteries supplying the heart, and a special fluid (called contrast medium on dye) is injected. This fluid is visible by X-ray and picture that are obtained are called angiogram. A. Normal –> Adequate blood supply to the heart is a normal finding with a coronary angiogram. How many coronary arteries are blocked? The degree of each blockage. These results can help the doctor make decisions regarding treatment for your heart disease. Reducing your risk factors involves making lifestyle changes. If you smoke, quit and avoid passive smoking too. Dietary changes: Reduce your cholesterol, Low-fat, and low-cholesterol foods are recommended. Limiting alcohol to no more than one drink a day( 30ml of alcohol). Control your blood pressure: Diastolic or the denominator of your blood pressure should always be less than 90mmHg. A low sodium diet can help achieve this in borderline hypertensive. Manage blood sugar: A fasting blood sugar of less than 120mg/dl and glycosylated hemoglobin level( this tells you the sugar control that you had over the last 12 weeks) of 6-7 %. Increase your exercise/activity level to help achieve and maintain a healthy weight and reduce stress. But, check with your doctor before starting an exercise program. Ask your doctor about a cardiac rehabilitation program. Sometime lifestyle changes aren’t enough to control your heart disease, medications may be required to treat certain risk factors, such as high cholesterol or high blood pressure, to help your heart work more efficiently and receive more oxygen-rich blood. Not all coronary artery disease needs intervention. Sometimes one may have non occlusive coronary artery disease with risk factors that are not controlled with lifestyle changes. In such group of patients one may need to take medicines prescribed by them. Statins: A group of drugs that help lowers the triglycerides and bad cholesterol(LDL cholesterol) and increase the good cholesterol (HDL cholesterol). They also help in plaque stabilization and lower the risk of heart attacks when used in combination with other drugs like aspirin. Anti platelet agents: These drugs reduce the stickiness of platelets ( cells in the blood that help form blood clots). They reduce the risk and intensity of an attack if one is at risk. Aspirin and clopidogrel are the two commonly used drugs and should be used with prescription only as they can cause gastritis and stomach bleed in vulnerable patients. Anti diabetic medication: oral agents or insulin in order to keep tighter sugar control. Angioplasty opens blocked arteries and restarts normal blood flow to your heart muscle. It is not a major surgery. It is done by inflating a tiny balloon at the side of the block. In many patients a collapsed wire mesh tube called a stent is deployed at the site of narrowing. This acts as a scaffolding to help prevent it from renarrowing after the angioplasty. If your angiography reveals Coronary Artery Disease (narrowing or blockages in the arteries that restrict blood flow to the heart), your cardiologist may then perform a Non-Surgical Coronary Intervention to remove the obstruction from the arteries and replenish the blood flow to the heart. These procedures includes: Angioplasty and Stent Implantation. A. Angioplasty – During an angioplasty, also called percutaneous transluminal coronary angioplasty (PTCA), a guide wire is passed directly to the blocked vessel. A tiny, deflated balloon is passed through the catheter to the site of the obstruction. The balloon is inflated to compress the plague against the wall of artery, flattening it out so that blood can once again flow without obstruction. Since a balloon- tipped catheter is used, this is also referred to as a “balloon angioplasty “. B. Stent Implantation – A coronary stent is an expandable mesh tube (about one – half inch long) that is placed in an artery to maintain the free flow of blood through the vessel following an angioplasty or atherectomy. 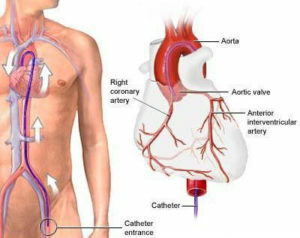 The mesh-like tube is inserted (while collapsed) into the artery by mounting it onto a balloon – tipped catheter. Once it is positioned in the area where the plaque was compressed or removed, the balloon is inflated, which then explants it against the coronary artery walls. The surgeon chooses the type of procedure based on individual patient needs. CABG is a heart surgery procedure in which one or more blocked coronary arteries are bypassed by a blood vessel graft to restore normal blood flow to the heart. These grafts usually come from the patient’s own arteries and veins located in the chest (thoracic), leg (saphenous) or arm (radial). The graft goes around the blocked artery (or arteries) to create new pathways for oxygen-rich blood to flow to the heart. The goals of the procedure are to relieve symptoms of coronary artery disease (including angina), enable the patient to resume a normal lifestyle and to lower the risk of a heart attack or other heart problems. 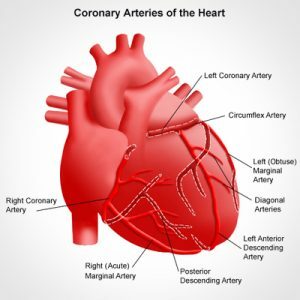 Coronary artery bypass surgery is widely performed in India. It is estimated that more than 800,000 coronary artery bypass graft surgeries are performed worldwide every year. Off Pump Bypass surgery: This is the most commonly used technique at our institution and in this technique the heart is beating normally and a small portion of the heart is stopped with the help of vacuum stabilizers to enable the surgeon do the bypass graft. The technique is of advantage in patients with bad lungs or other reasons where use of the heart lung machine is contraindicated. On pump Bypass surgery: In this technique the heart is stopped and placed on the heart lung machine to enable the surgeon to complete the bypass procedure. Minimally invasive bypass surgery: The days of long incisions are long gone. Now one can do bypass surgery through this technique also called MINI BYPASS Surgery, the length of the incision is 8-10cm and the chest bone is divided partially.Using a vacuum stabilizer on a beating heart one can perform multivessel bypass procedure. The advantages are low risk of infections, less pain and faster recovery. Minimally invasive direct coronary artery bypass (MIDCAB): Done through a lateral thoracotomy ( incision through the rib spaces) applied to do a single vessel bypass. This is used only for left internal mammary artery (LIMA) to the left anterior descending artery (LAD) graft. The length of the incision is 6-8cm. Internal mammary arteries [also called IMA grafts or internal thoracic arteries (ITA)] are the most common bypass grafts used, as they have shown the best long-term results. In most cases, these arteries can be kept intact at their origin because they have their own oxygen-rich blood supply, and then sewn to the coronary artery below the site of the blockage. Over the last decade, most patients received at least one internal mammary artery graft. Some patients also are candidates for surgery using new robotic techniques, allowing surgeons to perform bypass surgery in a closed chest, beating-heart environment through small keyhole incisions. The entire surgical procedure takes 3-4 hours. The patient is shifted to intensive care unit and is there for a period of twenty four hours. The next day he can get out of bed and walk. Once he is able to do this comfortable he is shifted to the ward and here he stays for a period of 3-4 days. Full recovery from coronary artery bypass graft surgery takes around two months. Most patients are able to drive in about three to eight weeks after surgery. Your doctor will provide specific guidelines for your recovery and return to work, including specific instructions on activity and how to care for your incision and general health after the surgery. 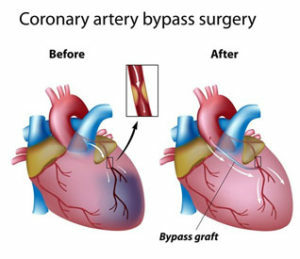 Coronary artery bypass graft surgery reduces the risk of major adverse cardiac events and relieves angina well but does not prevent coronary artery disease from recurring, therefore lifestyle changes and prescribed medications are strongly recommended to reduce this risk. When these traditional treatments are not options for you, doctors may suggest other less traditional therapies, such as Transmyocardial revascularization(TMR) or External counterpulsation(EECP). Your cardiologist (heart doctor) will want to see you on a regular basis for a physical exam and possibly to perform diagnostic tests. Your doctor will use the information gained from these visits to monitor the progress of your treatment. Check with your heart doctor to find out when to schedule your next appointment.